Rapid ID - ABG & Lung Volumes Reference lung volumes and see differences be.. Rapid ID - ABG & Obstructive/Restrictive Lung Disease Need a quick referenc.. Rapid ID - ABG & Sepsis The quickest way to reference acid-base values and .. Rapid ID - Body Planes & Sepsis Need a quick reference for Body Planes and Sepsis?.. Rapid ID - CHADS he quickest way to assess patients for the use of anticoagulat.. Rapid ID - Dermatomes Need a quick Dermatome reference guide? Our Rapid ID cards are the mo.. Rapid ID - EKG Myocardial Infarction Need a quick reference for EKG interpretations with my.. 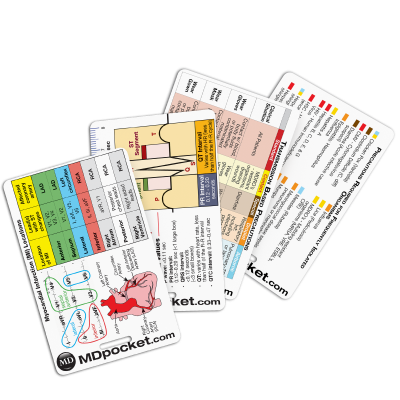 Rapid ID - EKG & RASS Need a quick reference for EKG interpretations and RASS scoring? .. Rapid ID - EKG & Ruler Combo Pack Combine our Rapid ID - Intervals and Measures with th.. Rapid ID - EKG Intervals & Measures Need a quick reference for EKG interpretations to h.. Rapid ID - Healthcare Provider Precautions Don't remember what precautions are needed i.. Rapid ID - Hypertension & Adult BMI Classify a patient’s Body Mass Index (BMI) wi.. Rapid ID – Labs Reference all your daily labs with this Rapid ID card containing.. Rapid ID - Lung Volumes & Obstructive/Restrictive Lung Disease Need a quick reference o.. Rapid ID - Lung Volumes & Spirometry Reference lung volumes and be able to assess them ..